This smoked Gouda cheese bread is chewy and light with a crispy crust and the distinct flavor of smoked Gouda. It’s perfect to serve warm with soup but it’s even better for extra cheesy grilled cheese sandwiches! For this recipe you’ll need: active dry yeast, sugar, powdered ginger, bread flour, salt, butter, buttermilk, Smoked Gouda, baking powder, egg, a large bowl, a stand mixer (preferably Bosch) and a heavy baking sheet. I love cheese of all kinds but smoked Gouda is my favorite. It adds that smoky tangy flavor to mac and cheese that just takes it to a new level of yumminess, as far as I’m concerned. I never thought about putting it in bread until the other day when I was putting together some bread for dinner. I was snacking on some smoked Gouda as I worked because I am really trying to lose this 20 pounds I picked up when my medications were off. I had lost most of my post-thyroidectomy weight and had only a few pounds to reach goal when my thyroid meds stopped working efficiently for some reason and back up the scales I went! I’ve lost all but 20 pounds of that and I’d really like to drop the rest before my birthday in April. Anyway, that’s why I had several small squares of Gouda on a dish on the counter. I am terribly about popping food in my mouth without thinking about it. As I was putting the dough together I just all of a sudden wondered what smoked Gouda would taste like in bread. The answer is that it tastes fabulous. You get the crispy, cheesy crust and then chewy bread with pops of smoky-cheesy flavor randomly skittering across your tastebuds. It’s fantastic! I made this smoked Gouda cheese bread into free form loaves but you could certainly make this bread in a regular loaf pan so you could slice it for sandwiches. 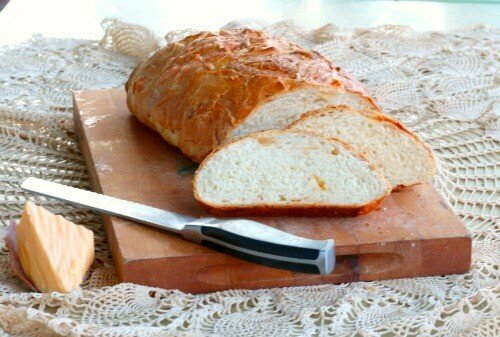 It’s chewy like a good loaf of Italian bread but not so chewy that kids won’t like it. The following links are affiliate links. I’ve added them because I think you may find the products helpful in your bread baking. If you click through and buy I will get a small commission that I use to keep the blog up and running. Thank you so much for being a part of Restless Chipotle! Just a quick note… If you’ve wanted to learn to bake bread but it never comes out quite the way you think it should… you might like my new book, Bread BootCamp. It’s gotten great reviews! Here’s that Gouda Bread recipe! 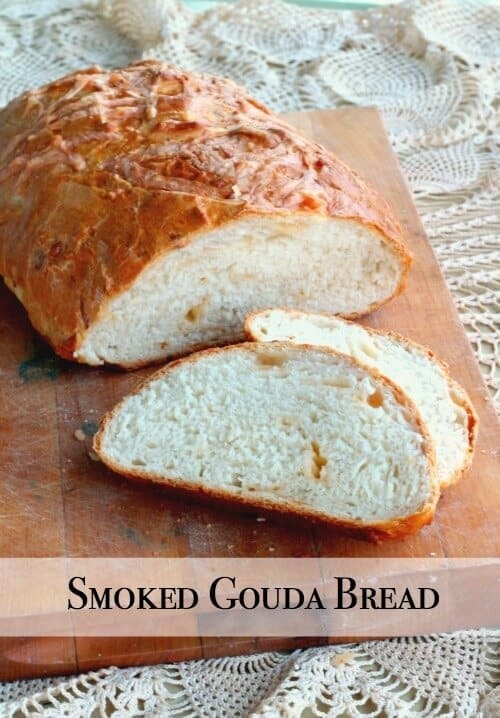 Smoked Gouda Cheese Bread is chewy with a crisp crust and lots of smoky cheese flavor. It's great for sandwiches or toast - imagine it on grilled cheese! 1/4 cup unsalted butter, , melted and cooled so that it is warm to the touch but not hot. In a medium sized bowl mix the ginger, sugar, yeast, and warm water. Add 1-1/2 cups of the cheese, reserving 1/2 cup for the crust. You can also knead in your mixer according to manufacturer's directions. Form into loaves the shape of your choice or place in greased loaf pans. 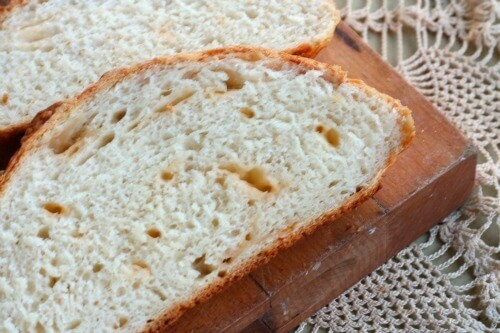 Brush the bread loaves with the beaten egg mixed with 1 teaspoon of water. Gently run a knife around the edge of the pan if you used one; between the bread and the pan to loosen it. Cover the loaves as they cool if you want soft crusts. I discovered Smoked Gouda Bread about a year ago, when a vendor at our local farmers market had it. I took my first loaf home and WOW – I toasted it for breakfast, oven toasted it with supper, and made grilled cheese sandwiches with it. Can’t imagine a regular grilled cheese anymore. Now that our farmers market is closed, I’ve been meeting with my bread guy at a gas station next to the interstate to get my “stash”, buying 4 or 5 loaves at a time. They freeze well and I get one loaf to last me a week. I have also shared these with my grown daughters, and they love it as well. I am excited to try to make it myself!!! Thank you for the recipe! I noticed when the weather turned cold last Fall that my pants were uncomfortably tight at the waist. It took me 3 months to get around to buying a new battery for my scale, but what a shock when I finally did–I was within 8 pounds of my weight the morning before my C/S with my son! Ain’t no baby in this belly and no placenta on these thighs, though, sadly. That slap upside the head a week ago has sure helped motivate me. I feel your pain. And now, I need gouda. It will have to wait until all the Christmas Cheese (a big wheel of Amish cheese from my in-laws and an assortment of Univ Wisconsin River Falls cheese from my folks) gets consumed. THEN AND ONLY THEN will I allow myself to be tempted by the fancy cheese counter. LOL! If a store ever opens that carries just cheese, chocolate, and wine I am a goner. Wow, I can taste this from across the web. 🙂 This is a must try–for sure! 🙂 Let me know what you think…. Marye, you really are the bread master! This cheesy bread looks like another winner! Well, I’ve been making it long enough…lol! Thank you! Hi Marye, this bread looks awesome, gouda is a weakness of mine. Or strength, depends on how you look at it I guess. 🙂 This would be delicious with a steaming bowl of soup. I also buy yeast in bulk – so much cheaper and so convenient. Thanks Kacey! It really is unique. Gouda is my husband’s favorite cheese! This sounds wonderful!